I'm very psyched to be doing the Global Game Jam for the fourth time-- all around the world people form small teams in order to make interesting games, all over one-48-hour weekend. that lets me create a box, give it a color, and then ask it do draw itself. The first simplification of "do these boxes overlap?" can be "do these boxes overlap horizontally AND vertically"? Because two boxes could be around the same x-coordinate, but if one is way higher than the other one, they won't overlap-- and vice versa for the y-coordinate. By breaking down the problem this way, we're turning our 2 dimensional issue into a 2 1 dimensional ones... much easier! 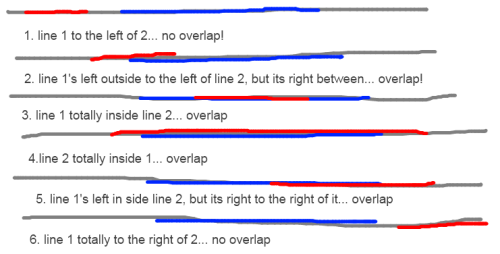 I don't know about you, but my takeaway was this: there are more ways for two lines to overlap than for them not to... therefore, we're going to just test for the two cases where they don't - namely where both of line1's points are to the left of line 2's left or both the points are to the right of line 2's right. overlapVert() should be pretty obvious from that. You can see the full psj sourcecode here. Short but sweet: "background-position" tends to be a compound kind of setting, with a separate value for x and y, but the single key. This means jQuery's default animation function can't smooth animate it, like it can't animate color transitions. But just like how there's a plugin to let you animate colors there's one for backgroundPosition as well. There's not much to it besides what the page says. I stuck copies of both on my "just in case the links go away" jquery file archive at http://kirkjerk.com/m/files/. This is a work in progress for my day job, but I'm digging it so far: squares that jiggle on hover, then expand to twice the size when you "hold". (Live demo from http://kirkjerk.com/m/files/kirkdev/topicgrid/) These are all divs positioned absolutely with a containing div. The "shove the small blocks out of the way" routine our UX guy Marco was looking for was hard to wrap my head around at first. Say we're growing 0-0, doubling its height and width so it takes 4 spaces instead of 1, a net change of 3 spaces. We start by shoving the columns topped by 0-1 and 1-1 straight down, freeing 2 of the squares. We then shove 1-0 to the right, freeing up the final square. And to make room for 1-0, the column topped by 2-0 has to be pushed down. (But if the block we're growing is on the right side of the layout we change its position so that it grows to the left, and that changes which side our single column down is on.) It seems pretty simple (to me, now) when I write it out (3 groups of blocks to move: the 2 cols. underneath, the singleton off to the side, the single col. down to make room for the singleton) but I kind of had to sleep on it to get the general case. The other fun and educational part was the "jiggle" when you hover the mouse over a block-- this creates a small juicy "toy" as you sweep your mouse across the whole area. My first idea was trying to use one of the bounce-y easings, but keep the block the same size. This did precisely nothing... I think the easings generally depend on multiples of the difference between two values like width/height or position so you can't "ease in place". I then tried the JQuery UI effect "bounce", but it assumes you have something that can be positioned "relative" on the page, and left the div stuck to the top left when it was done. So I rolled my own, using a series of animations (using the built-in linear easing instead of the default swing)- it animates to random x and y offsets, then animates to half the opposite of those values, then settles back to where it was. This isn't perfected yet, but it's pretty good. I had to look into different techniques for restoring the squares... I thought always stop()ing the animation would help, but that just got blocks stuck. So now it just adds the move onto the animation queues, but it works out, in part because things are pretty briskly paced.